Sneaker customizer SBTG and DC life team up to present a portion of the DC Life Artist Series Project titled "Circus of Mutants". 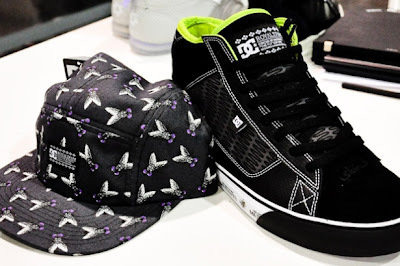 A pair of sneakers will drop along with a couple hats and apparel items to match the sneaker. The sneak is basically a black and lime green colorway with SBTG detailing used throughout the upper. 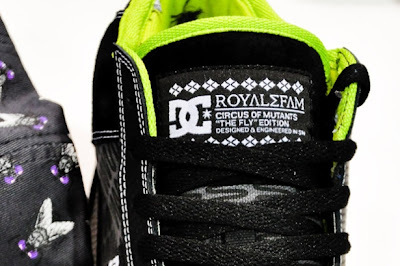 The white sole has a design of a fly along with the words "Circus of Mutants", and the tongue tag reads "Royalfam and Circus of Mutants 'The Fly' Edition. According to Hypebeast, a release may appear around Spring 2010. Is this the start of something big? I don't really know yet for sure to be honest. You can however, expect to see more on this collection as info comes in. WE'RE REBOOTING - SO GET READY!!!!!!! !